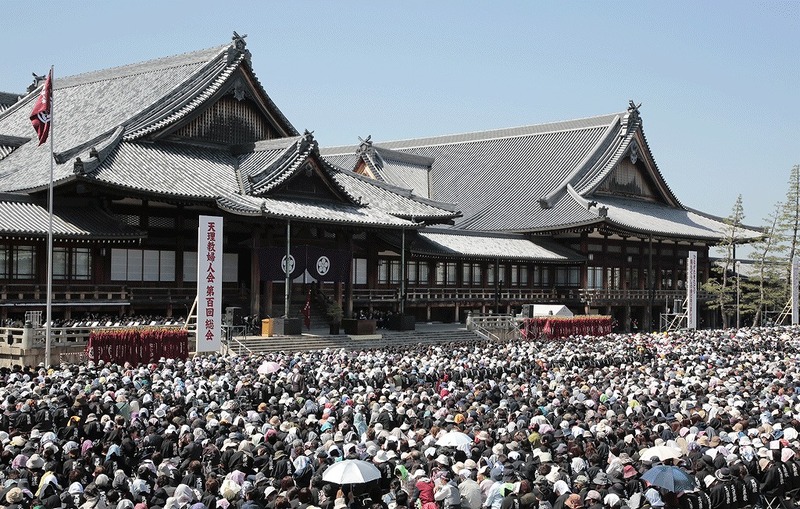 Tenrikyo Women’s Association held its 100th convention in the Inner Courtyard of Church Headquarters on April 19, the day after the Oyasama Birth Celebration Service. The occasion drew some 40,000 members. The convention was blessed with clear blue skies. When the registration desks opened at 8:00 a.m., groups of members began to file into the Sanctuary precincts one after another, carrying the banners of their chapters. At 9:30 a.m., Women’s Association President Harue Nakayama escorted the Shinbashira, Successor-Designate Daisuke Nakayama and his wife, and other guests into the Inner Courtyard. The ceremony began with the singing of the Eight Verses of the Yorozuyo. This was followed by a pledge made by a representative of new members and a progress report presented by Committee Member Emiko Moroi. President Nakayama then delivered her address, touching upon the Seminar for Successors that was held from last August to late March this year. She said that whether or not those who had attended the seminar would be active in carrying the path forward in the future depended on the care and nurture they received from their churches. She thus urged the members to continue to guide and nurture them. After mentioning that the Women’s Association was holding its 100th convention, she talked about how the association had been established in accord with God the Parent’s intention. She then reflected on how its members’ predecessors had resolutely upheld the fundamental spirit of the Women’s Association and fulfilled the main task of serving as the “foundation of the path” with the successive association presidents as the core, while relying on Oyasama’s Divine Model and receiving guidance from the successive Shinbashiras. She stated that she could feel the weight of history behind the 100 association conventions as she gave thought to the boundless parental love of God the Parent and Oyasama, who had patiently guided the Women’s Association, and to the painstaking efforts of the members’ predecessors. Then, quoting several Ofudesaki verses referring to the Truth of Origin, she stated that saving people through teaching the origin is the essence of salvation in the teachings of Tenrikyo. She went on to say that she would like all members to convey the teaching of the Truth of Origin and the day of origin of their family’s faith to their children and those close to them. She urged the members to respond to their predecessors’ painstaking efforts and God the Parent and Oyasama’s parental love, by carrying on the mission of ensuring that the path continues through future generations. She further stated that in order to convey the teachings to future generations, it is vital for all members to make earnest efforts to be the first ones to proactively study the teachings and settle them in their minds.